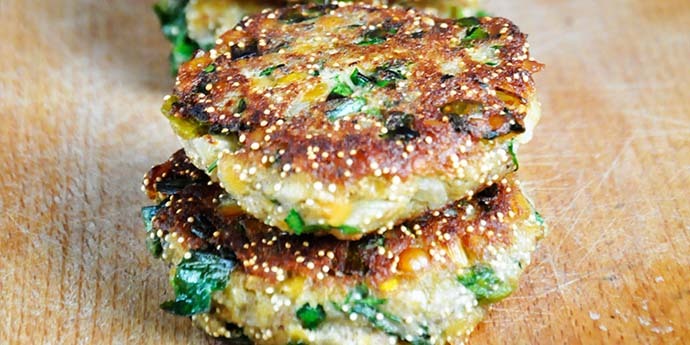 These lentils and amaranth patties are healthy, easy to make, vegan and delicious! You’ll love their crispy texture and lovely taste! Plus, they are super-rich in proteins! Amaranth is an over 8000 years old gluten-free cereal. In Ancient Greece it was considered a sacred plant and a symbol of eternal youth. Amaranth can be named a super-cereal, as it is very rich in nutrients. It’s also known for its high concentration of proteins, vitamins, essential amino acids and minerals. Amaranth also lowers cholesterol levels and has amazing anti-cancer properties. Mix the ground flax and water in a small bowl and set aside for 5 minutes to thicken. Add red lentils and amaranth in a pot. Cover with water and boil for 15 minutes. Strain them. Put them in a large bowl and blend in all the other ingredients, except oil. If the composition is too moist, add more breadcrumbs. The patties should be easy to form. Heat some oil in a non-stick frying pan. Make the patties – 1 tbsp. per patty. Fry them 2 minutes on each side.